A radical discovery by researchers at Harvard and Raytheon BBN Technology about graphene’s hidden properties could lead to a model system to explore exotic phenomena like black holes and high-energy plasmas, as well as novel thermoelectric devices. In a paper published Feb. 11 in Science, the researchers document their discovery of electrons in graphene behaving like a fluid. To make this observation, the team improved methods to create ultra-clean graphene* and developed a new way to measure its thermal conductivity. In ordinary 3D metals, electrons hardly interact with each other. But graphene’s two-dimensional, honeycomb structure acts like an electron superhighway in which all the particles have to travel in the same lane. The electrons in this ultra-clean graphene act like massless relativistic objects, some with positive charge and some with negative charge. They move at incredible speed — 1/300 of the speed of light — and have been predicted to collide with each other ten trillion times a second at room temperature. These intense interactions between charge particles have never been observed in an ordinary metal before. Most of our world is described by classical physics. But very small things, like electrons, are described by quantum mechanics while very large and very fast things, like galaxies, are described by relativistic physics, pioneered by Albert Einstein. Combining these different sets of laws of physics is notoriously difficult, but there are extreme examples where they overlap. High-energy systems like supernovas and black holes can be described by linking classical theories of hydrodynamics with Einstein’s theories of relativity. But since we can’t run an experiment on a black hole (yet), enter graphene. When the strongly interacting particles in graphene were driven by an electric field, they behaved not like individual particles but like a fluid that could be described by hydrodynamics. 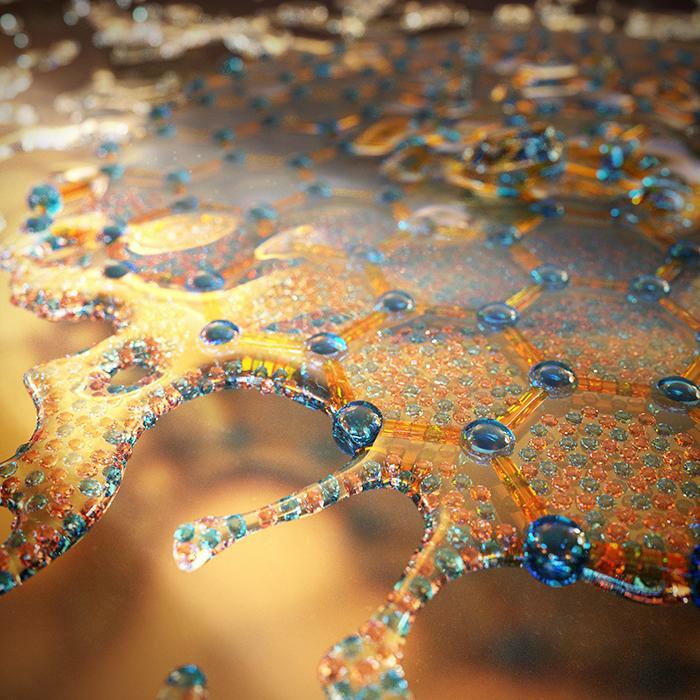 A small chip of graphene could also be used to model the fluid-like behavior of other high-energy systems. To observe the hydrodynamic system, the team turned to noise. At finite temperature, the electrons move about randomly: the higher the temperature, the noisier the electrons. By measuring the temperature of the electrons to three decimal points, the team was able to precisely measure the thermal conductivity of the electrons. “This work provides a new way to control the rate of heat transduction in graphene’s electron system, and as such will be key for energy and sensing-related applications,” said Leonid Levitov, professor of physics at MIT. The research was led by Philip Kim, professor of physics and applied physics at The Harvard John A. Paulson School of Engineering and Applied Sciences (SEAS). * The team created an ultra-clean sample by sandwiching the one-atom thick graphene sheet between tens of layers of an electrically insulating perfect transparent crystal with a similar atomic structure of graphene. Next, the team set up a kind of thermal soup of positively charged and negatively charged particles on the surface of the graphene, and observed how those particles flowed as thermal and electric currents. Interactions between particles in quantum many-body systems can lead to collective behavior described by hydrodynamics. One such system is the electron-hole plasma in graphene near the charge neutrality point, which can form a strongly coupled Dirac fluid. This charge neutral plasma of quasi-relativistic fermions is expected to exhibit a substantial enhancement of the thermal conductivity, thanks to decoupling of charge and heat currents within hydrodynamics. Employing high sensitivity Johnson noise thermometry, we report an order of magnitude increase in the thermal conductivity and the breakdown of the Wiedemann-Franz law in the thermally populated charge neutral plasma in graphene. This result is a signature of the Dirac fluid, and constitutes direct evidence of collective motion in a quantum electronic fluid. BARCELONA, Spain, Jan. 21, 2016 — Combining nanoelectromechanical (NEMS) systems with on-chip optics holds promise as a method to actively control light at the nanoscale, and now a hybrid system has overcome the challenges of integrating such nanoscale devices with optical fields thanks to the material graphene. 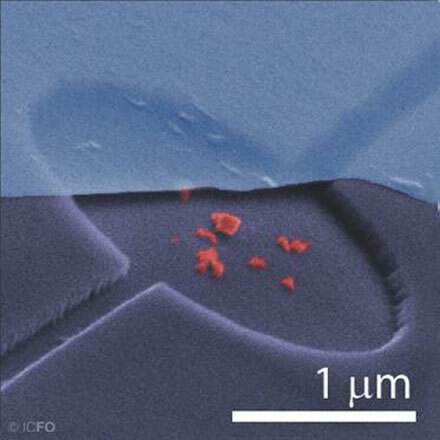 Researchers from the Institute of Photonic Sciences (ICFO) have demonstrated an on-chip graphene NEMS suspended a few tens of nanometers above nitrogen-vacancy centres (NVCs), which are stable single-photon emitters embedded in nanodiamonds. The work confirms that graphene is an ideal platform for both nanophotonics and nanomechanics, the researchers said. Due to its electromechanical properties, graphene NEMS can be actuated and deflected electrostatically over a few tens of nanometers with modest voltages applied to a gate electrode, the researchers found. The graphene motion can thus be used to modulate the light emission by the NVC, while the emitted field can be used as a universal probe of the graphene position. The optomechanical coupling between the graphene displacement and the NVC emission is based on near-field, dipole-dipole interaction. False color scanning electronic micrograph of a hybrid graphene-nitrogen-vacancy nearfield nano-optomechanical system. Courtesy of ICFO. The researchers observed that the coupling strength increased strongly for shorter distances and was enhanced because of graphene’s 2D character and linear dispersion. These achievements hold promise for selective control of emitter arrays on-chip, optical spectroscopy of individual nano-objects, and integrated optomechanical information processing. The ICFO team also said the hybrid device could advance quantum optomechanics. The research was published in Nature Communications (doi: 10.1038/ncomms10218). Antoine Reserbat-Plantey, Kevin G. Schädler, Louis Gaudreau, Gabriele Navickaite, Johannes Güttinger, et al. Despite recent progress in nano-optomechanics, active control of optical fields at the nanoscale has not been achieved with an on-chip nano-electromechanical system (NEMS) thus far. Here we present a new type of hybrid system, consisting of an on-chip graphene NEMS suspended a few tens of nanometres above nitrogen-vacancy centres (NVCs), which are stable single-photon emitters embedded in nanodiamonds. Electromechanical control of the photons emitted by the NVC is provided by electrostatic tuning of the graphene NEMS position, which is transduced to a modulation of NVC emission intensity. The optomechanical coupling between the graphene displacement and the NVC emission is based on near-field dipole–dipole interaction. This class of optomechanical coupling increases strongly for smaller distances, making it suitable for nanoscale devices. These achievements hold promise for selective control of emitter arrays on-chip, optical spectroscopy of individual nano-objects, integrated optomechanical information processing and open new avenues towards quantum optomechanics. An international study headed by the European Graphene Flagship research consortium has found that graphene is a promising material for use in electrodes that interface with neurons, based on its excellent conductivity, flexibility for molding into complex shapes, biocompatibility, and stability within the body. The graphene-based substrates they studied* promise to overcome problems with “glial scar” tissue formation (caused by electrode-based brain trauma and long-term inflammation). To avoid that, current electrodes based on tungsten or silicon use a protective coating on electrodes, which reduces charge transfer. Current electrodes are also rigid (resulting in tissue detachment and preventing neurons from moving) and generate electrical noise, with partial or complete loss of signal over time, the researchers note in a paper published recently in the journal ACS Nano. Electrodes are used as neural biosensors and for prosthetic applications — such as deep-brain intracranial electrodes used to control motor disorders (mainly epilepsy or Parkinson’s) and for brain-computer interfaces (BCIs), used to recover sensory functions or control robotic arms for paralyzed patients. These applications require an interface with long-term, minimal interference. 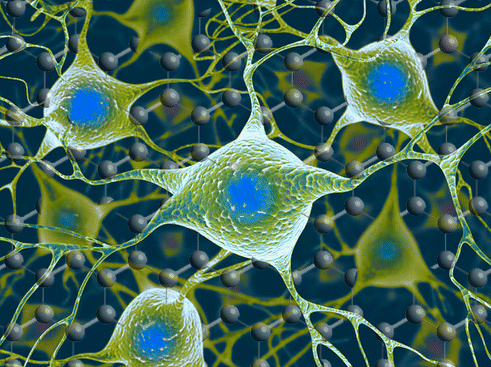 “For the first time, we interfaced graphene to neurons directly, without any peptide-coating,” explained lead neuroscientist Prof. Laura Ballerini of the International School for Advanced Studies (SISSA/ISAS) and the University of Trieste. 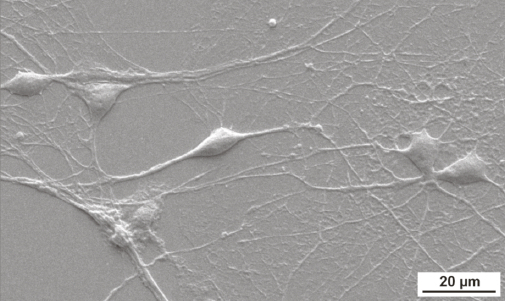 Using electron microscopy and immunofluorescence, the researchers found that the neurons remained healthy, transmitting normal electric impulses and, importantly, no adverse glial reaction, which leads to damaging scar tissue, was seen. The interdisciplinary collaboration also included the University Castilla-La Mancha and the Cambridge Graphene Centre. * The study used two methods of creating graphene-based substrates (GBSs). 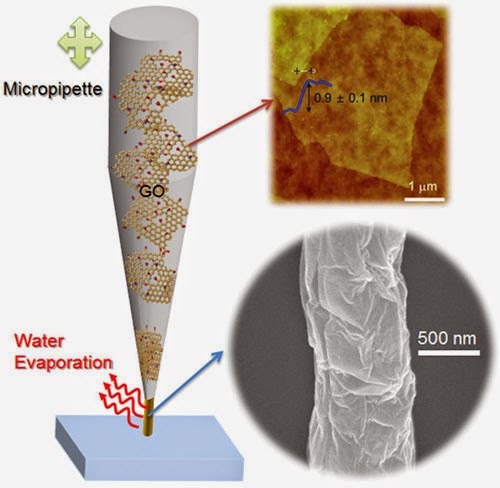 Liquid phase exfoliation (LPE) — peeling off graphene from graphite — can be performed without the potentially hazardous chemical treatments involved in graphene oxide production, is scalable, and operates at room temperature, with high yield. LPE dispersions can also be easily deposited on target substrates by drop-casting, filtration, or printing. Ball milling (BM), with the help of melamine (which forms large hydrogen-bond domains, unlike LPE), can be performed in a solid environment. “Our data indicate that both GBSs are promising for next-generation bioelectronic systems, to be used as brain interfaces,” the paper concludes. Fabbro A., Scaini D., León V., Vázquez E., Cellot G, Privitera G., Lombardi L., Torrisi F., Tomarchio F., Bonaccorso F., Bosi S., Ferrari A. C., Ballerini L. and Prato M. Graphene-Based Interfaces do not Alter Target Nerve Cells. ACS Nano 5b05647. Researchers have successfully demonstrated how it is possible to interface graphene – a two-dimensional form of carbon – with neurons, or nerve cells, while maintaining the integrity of these vital cells. The work may be used to build graphene-based electrodes that can safely be implanted in the brain, offering promise for the restoration of sensory functions for amputee or paralyzed patients, or for individuals with motor disorders such as epilepsy or Parkinson’s disease. The research, published in the journal ACS Nano, was an interdisciplinary collaboration coordinated by the University of Trieste in Italy and the Cambridge Graphene Centre. Our understanding of the brain has increased to such a degree that by interfacing directly between the brain and the outside world we can now harness and control some of its functions. For instance, by measuring the brain’s electrical impulses, sensory functions can be recovered. This can be used to control robotic arms for amputee patients or any number of basic processes for paralyzed patients – from speech to movement of objects in the world around them. Alternatively, by interfering with these electrical impulses, motor disorders (such as epilepsy or Parkinson’s) can start to be controlled. The research was funded by the Graphene Flagship, a European initiative which promotes a collaborative approach to research with an aim of helping to translate graphene out of the academic laboratory, through local industry and into society. To investigate how prospective memory is processed in the brain, psychological scientist Mark McDaniel of Washington University in St. Louis and colleagues had participants lie in an fMRI scanner and asked them to press one of two buttons to indicate whether a word that popped up on a screen was a member of a designated category. In addition to this ongoing activity, participants were asked to try to remember to press a third button whenever a special target popped up. The task was designed to tap into participants’ prospective memory, or their ability to remember to take certain actions in response to specific future events. When McDaniel and colleagues analyzed the fMRI data, they observed that two distinct brain activation patterns emerged when participants made the correct button press for a special target. When the special target was not relevant to the ongoing activity—such as a syllable like “tor”—participants seemed to rely on top-down brain processes supported by the prefrontal cortex. In order to answer correctly when the special syllable flashed up on the screen, the participants had to sustain their attention and monitor for the special syllable throughout the entire task. In the grocery bag scenario, this would be like remembering to bring the grocery bags by constantly reminding yourself that you can’t forget them. When the special target was integral to the ongoing activity—such as a whole word, like “table”—participants recruited a different set of brain regions, and they didn’t show sustained activation in these regions. The findings suggest that remembering what to do when the special target was a whole word didn’t require the same type of top-down monitoring. Instead, the target word seemed to act as an environmental cue that prompted participants to make the appropriate response—like reminding yourself to bring the grocery bags by leaving them near the front door. “These findings suggest that people could make use of several different strategies to accomplish prospective memory tasks,” says McDaniel. McDaniel and colleagues are continuing their research on prospective memory, examining how this phenomenon might change with age. Co-authors on this research include Pamela LaMontagne, Michael Scullin, Todd Braver of Washington University in St. Louis; and Stefanie Beck of Technische Universität Dresden. This research was funded by the National Institute on Aging, the Washington University Institute of Clinical and Translation Sciences, the National Center for Advancing Translational Sciences, and the German Science Foundation. If you have a 3D printer then you are likely overwhelmed by the sheer number of possible objects you can find online to print out. At the same time, the technology is somewhat limited, unless you have professional CAD skills or are incredibly creative. What, for instance, would you do if you wanted to take an everyday item such as a hot glue gun and print an attached stand for it, or turn your child’s favorite action figure into a magnet? Four researchers at Carnegie Mellon University, Xiang ‘Anthony’ Chen, Stelian Coros, Jennifer Mankoff and Scott E. Hudson, believe that they can change this via a new WebGL-based tool under development called Encore. Funded by the National Science Foundation under grant NSF IIS 1217929, Encore is a multifaceted tool which enables three different techniques to augment already existing objects. The researchers call these three techniques Print-Over, Print-to-Affix and Print-Through, all of which allow for the adherence of newly 3D printed attachments to other objects. Before we get into what each of these three techniques involves, one first should understand the computational pipeline involved in designing these attachments. This technique, in my opinion, is one of the coolest, as it allows for the printing of an attachment directly on a given object. Once Encore establishes the parameters required and sizes up the model to fit the target object, it will automatically tell the printer to print supports to hold the target item in place. Once the target item is in place, Encore will then tell the printer to begin printing the attachment in a particular spot on the target item, based on its geometric analysis of that object. “It is also important to ensure that the existing object will not impede the motion of the print head while the attachment is being printed,” warn the researchers. An example used by the researchers for this technique was a magnet holder which they directly attached to a teddy bear figurine. They also printed an LED light onto a 9V battery by first placing a small amount of glue on the battery prior to beginning to print on top. This approach is similar to the Print-Over technique, only that instead of printing an attachment directly onto the target object, Encore will analyze the geometry of the target object prior to printing in order to create an attachment which will fit perfectly on that object via glue, straps (zip-ties) or even snaps. Once the attachment is printed the user can then use hot-glue or another adhesive or attachment mechanism to affix the printed object onto the target. This technique is perfect for items which you don’t want to physically attach, but instead can connect to an object. For instance a tag on the loop of a pair of scissors or a charm onto a bracelet. This process requires that the printer be paused while a user manually places the target object within the print field. “Print-through has aesthetic qualities that distinguish it from print-to-affix and print-over – it typically creates a loose but permanent connection between two objects,” explained the researchers. While the new Encore tool is still under development as researchers improve upon its analytical capabilities, it certainly seems to show promise to those of us wishing to do more than just fabricate new items. In fact, the researchers were able to show that via all three techniques they could save a substantial amount of time and material over printing an object in one single piece. As an example, they used Slic3r to estimate the print time and total material required for printing a typical Utah teapot with a torus-shaped handle, as well as just printing the handle onto an already fabricated Utah teapot. Their estimate showed that the time of fabricating the item could be cut by more than 80% and material use reduced by as much as 85% by using their techniques and the Encore tool. There are many variables going into the tool’s decision making algorithms, such as determining where to place attachments for the best balance when holding an object, what placement of an attachment will result in the best adhesion, etc. More research is still required as the team continues to develop the tool, as well as new techniques to attach multiple parts to one object, but it certainly seems like something which could have a sizable impact on the industry in general. Let us know your thoughts on the Encore tool in the Augmenting 3D Prints forum thread on 3DPB.com. Furthermore, the pre- and post-printing cost amount to a significant proportion of total cost per printed part. So even when the cost for printers materials come down, the labor-cost penalty will remain. 3D printing simply works best in areas where customization is key — from printing hearing aids and dental implants to printing a miniature of the happy couple for their wedding cake. Using a combination of 3D scanning and printing, implants can be customized to specific anatomic circumstances in a way that was simply not feasible beforehand. However, we also know that 99% of all manufactured parts are standard and do not require customization. In these cases, 3D printing has to compete with scale-driven manufacturing processes and rather efficient logistics operations. A good example is the wrench that NASA printed on the International Space Station last year. The cost of shipping it to the space station would have been at least $400 (assuming the unpackaged weight of 18 grams per wrench and using the most recent cost data given by NASA for transporting goods into lower-earth orbit); in comparison, shipping it from China to the United States would only cost $0.002 per unit. Thus, while it makes a lot of sense to print the wrench on the space station, printing it for local consumption in the United States wouldn’t. The simple fact is that when customization isn’t important, 3D printing is not competitive. For one, printing costs per part are highly sensitive to the utilization of the “build room,” the three-dimensional area inside the 3D printer where the laser fuses the metal or plastic powder. Therefore, contract manufacturers that perform 3D printing such as Shapeways generally wait to fill a batch that uses the entire build room. Printing just one part raises unit cost considerably; so economies of scale do matter. Interestingly, the economic case for the most-cited standard part in 3D volume production today, the GE fuel nozzle for the CFM LEAP engine, is it is lighter and more fuel efficient, not a lower manufacturing cost per se. A second point often overlooked is that the labor cost that remains. Counter to common perception, 3D printing does not happen “at the touch of a button”; it involves considerable pre- and post-processing, which incur non-trivial labor costs. The starting point for any 3D printing process is a 3D file that can be “printed.” Just having an electronic CAD drawing is not sufficient; currently, there is no way to automatically convert the CAD drawing into a 3D file. Creating printable files involves two steps: creating a three-dimensional volume model that can be printed, and “slicing” that volume model in the best possible way to avoid material wastage and prevent printing errors. Both steps require tacit knowledge. Following the printing, the parts produced have to be recovered, cleaned, washed (or sanded and polished, in the case of metal prints), and inspected. This, in turn, means that using 3D printing for the aftermarket services — an application where it makes a lot of sense — requires making a significant upfront investment in generating the printable files of the spare parts that would likely be needed. This investment would have to outweigh the cost of keeping a lifetime supply of spare parts in inventory, which is a tough call for small bolts, brackets, and connectors that make up the bulk of aftermarket demand. So while I, like many others, have fallen in love with the notion of the “ultimate lean supply chain” of having 3D printers at every other corner table to print single parts just in time where they are needed, I am afraid that this vision does not stack up against reality. 3D printing technology undoubtedly has great potential. However, it is unlikely to replace traditional manufacturing. Instead, we should see it as a complement, a new tool in the box, and exploit its unique capabilities — both in making existing products better as well as being able to manufacture entirely new ones that we previously could not make. False teeth, hip joints and replacement knees – and potentially printable skin and organs – will drive growth in the burgeoning market for 3D printers over the next decade, according to new research. A report suggests that dentistry and medicine will increasingly harness one of the 21st century’s most exciting technological breakthroughs. The dental and medical market for 3D printers is expected to expand by 365% to $867m (£523m) by 2025, according to IDTechEx analysts, even before bio-printing technology is taken into account. If bio-printing becomes suitable for commercial use – which scientists hope will allow the printing of pieces of skin, liver or kidney using live cells – analysts estimate the medical market could reach a value of $6bn or more within 10 years. While printing of complete organs for transplants may be decades away, the use of pieces of tissue for laboratory toxicology tests for cosmetics or drugs could be ready within five years, helping the medical market for 3D printers overtake all other sectors. In the US, dental labs have invested in technology that can scan a patient’s teeth so new teeth can be produced by pressing the print button. Harrop said there are a number of stumbling blocks in the way of the commercial application of bio printing, but even in the past year, scientists have been able to extend the life of a piece of skin tissue created in the lab from just a few hours to 40 days, taking it closer to the three months required for toxicology tests. At present, 3D printers are most widely used in the automotive industry where they help produce prototypes for new cars or car parts. The next biggest market is aerospace, where manufacturers are using the technology to make lighter versions of complex parts for aeroplanes. Dentists have been using 3D printers to create exact replicas of jaws or teeth in order to aid complex procedures for a few years, but increasingly they are creating implants made of durable plastic or medical ceramics. “One thing is for sure, the supply chain isn’t going away. As usual, it will likely just get more complicated. Here are some of the areas that I propose will influence the supply chain as 3D printing becomes more and more mainstream, and I’m sure there are many more. 3D printing becomes industrial strength. Once reserved for prototypes and toys, 3D printing will become industrial strength. You will take a flight on an airliner that includes 3D-printed components, making it lighter and more fuel efficient. In fact, there are aircrafts that already contain some 3D-printed components. The technology will also start to be adopted for the direct manufacture of specialist components in industries like defense and automotive. Overall, the number of 3D printed parts in planes, cars and even appliances will increase without you knowing. 3D printing starts saving lives. 3D-printed medical implants will improve the quality of life of someone close to you. Because 3D printing allows products to be custom-matched to an exact body shape, it is being used today for making better titanium bone implants, prosthetic limbs and orthodontic devices. Experiments in printing soft tissue are underway, and may soon allow printed veins and arteries to be used in operations. Today’s research into medical applications of 3D printing covers nano-medicine, pharmaceuticals and even printing of organs. Taken to the extreme, 3D printing could one day enable custom medicines and reduce if not eliminate the organ donor shortage. Customization becomes the norm. You will buy a product, customized to your exact specifications, which is 3D-printed and delivered to your doorstep. Innovative companies will use 3D printing technologies to give themselves a competitive advantage by offering customization at the same price as their competitor’s standard products. At first this may range from novelty items like custom smartphone cases or ergonomic improvements to standard tools, but it will rapidly expand to new markets. The leaders will adjust their sales, distribution and marketing channels to take advantage of their capability to provide customization direct to the customer. Customization will also play a big role in healthcare devices such as 3D-printed hearing aids and artificial limbs. Product innovation is faster. Everything from new car models to better home appliances will be designed more rapidly, bringing innovation to you faster. Because rapid prototyping using 3D printers reduces the time to turn a concept into a production-ready design, it allows designers to focus on the function of products. Although the use of 3D printing for rapid prototyping is not new, the rapidly decreasing cost, improved design software and increasing range of printable materials means designers will have more access to printers, allowing them to innovate faster by 3D printing an object early in the design phase, modifying it, re-printing it, and so on. The result will be better products, designed faster. New companies develop innovative business models built on 3D printing. You will invest in a 3D printing company’s IPO. Start-up companies will flourish as a generation of innovators, hackers and “makers” take advantage of the capabilities of 3D printing to create new products or deliver services to the burgeoning 3D printer market. Some enterprises will fail, and there may be a boom-bust cycle, but 3D printing will spawn new and creative business models. 3D print shops open at the mall. 3D print shops will begin to appear, at first servicing local markets with high-quality 3D printing services. Initially designed to service rapid-prototyping and other niche capabilities, these shops will branch into the consumer marketplace. As retailers begin to “ship the design, not the product,” the local 3D print shop will one day be where you pick up your customized, locally manufactured products, just like you pick up your printed photos from the local Walmart today. Heated debates on who owns the rights emerge. As manufacturers and designers start to grapple with the prospect of their copyrighted designs being replicated easily on 3D printers, there will be high-profile test cases over the intellectual property of physical object designs. Just like file-sharing sites shook the music industry because they made it easy to copy and share music, the ability to easily copy, share, modify and print 3D objects will ignite a new wave of intellectual property issues. New products with magical properties will tantalize us. New products – that can only be created on 3D printers – will combine new materials, nano scale and printed electronics to exhibit features that seem magical compared to today’s manufactured products. These printed products will be desirable and have distinct competitive advantage. The secret sauce is that 3D printing can control material as it is printed, right down to the molecules and atoms. As today’s research is perfected into tomorrow’s commercially available printers, expect exciting and desirable new products with amazing capabilities. The question is: What are these products and who will be selling them? New machines grace the factory floor. Expect to see 3D printing machines appearing in factories. Already some niche components are produced more economically on 3D printers, but this is only on a small scale. Many manufacturers will begin experimenting with 3D printing for applications outside of prototyping. As the capabilities of 3D printers develop and manufacturers gain experience in integrating them into production lines and supply chains, expect hybrid manufacturing processes that incorporate some 3D-printed components. This will be further fueled by consumers desiring products that require 3D printers for their manufacture. “Look what I made!” Your children will bring home 3D printed projects from school. Digital literacy – including Web and app development, electronics, collaboration and 3D design – will be supported by 3D printers in schools. A number of middle schools and high schools already have 3D printers. As 3D printing costs continue to fall, more schools will sign on. Digital literacy will be about things as well as bits. If, as President Obama believes, a manufacturing revolution, led by 3D printing, is coming, it behooves business leaders in every field to ask themselves how it could affect their business model and assumptions about the future. Researchers in Korea have successfully 3D printed graphene nano-structures without the use of any other material. With the entire printed structure being composed of graphene, the strength, as well as full conductivity of the material can be taken advantage of. There is no question that graphene, has enormous potential, from solar cell technology, to electronics to medicine. A key factor in developing practical and commercial applications of the one-atom thick carbon sheets is in aligning the material in the desired form depending on the application. Now 3D printing of graphene is nearing a feasible stage and companies such as Graphene 3D Lab, are at the forefront of the technology. However, there is a difference between 3D printing pure graphene, and 3D printing a graphene/thermoplastic composites like Graphene 3D has been doing. While printing with composite materials, using a typical FDM/FFF or powder based laser sintering process, will keep some of graphene’s superior properties intact, most will be lost. The plastic will eventually break down leaving any prints weak, and not much different from a typical object you’d print with a MakerBot Replicator. Now, researchers, led by Professor Seung Kwon Seol from Korea Electrotechnology Research Institute (KERI), recentlypublished a paper in Advanced Materials where they describe a new process of directly 3D printing pure graphene. Their techniques mean that graphene nano-structures can be fabricated without the use of any other material. With the entire printed structure being composed of graphene, the strength, as well as full conductivity of the material can be realized. “We are convinced that this approach will present a new paradigm for implementing 3D patterns in printed electronics,” says Seol. For their technique, the team grew graphene oxide (GO) wires at room temperature using the meniscus formed at the tip of a micropipette filled with a colloidal dispersion of GO sheets, then reduced it by thermal or chemical treatment (with hydrazine). The deposition of GO was obtained by pulling the micropipette as the solvent rapidly evaporated, thus enabling the growth of GO wires. The researchers were able to accurately control the radius of the rGO wires by tuning the pulling rate of the pipette; they managed to reach a minimum value of ca. 150 nm. Using this technique, they were able to produce arrays of different freestanding rGO architectures, grown directly at chosen sites and in different directions: straight wires, bridges, suspended junctions, and woven structures. Seol points out that this 3D nanoprinting approach can be used for manufacturing 2D patterns and 3D geometry in diverse devices such as printed circuit boards, transistors, light emitting devices, solar cells, sensors and so on. University of Alberta researchers have found that abundant materials in the Earth’s crust can be used to make inexpensive and easily manufactured nanoparticle-based solar cells. The discovery, several years in the making, is an important step forward in making solar power more accessible to parts of the world that are off the traditional electricity grid or face high power costs, such as the Canadian North, said researcher Jillian Buriak, a chemistry professor and senior research officer of the National Institute for Nanotechnology based on the U of A campus. Buriak and her team have designed nanoparticles that absorb light and conduct electricity from two very common elements: phosphorus and zinc. Both materials are more plentiful than scarce materials such as cadmium and are free from manufacturing restrictions imposed on lead-based nanoparticles. “Half the world already lives off the grid, and with demand for electrical power expected to double by the year 2050, it is important that renewable energy sources like solar power are made more affordable by lowering the costs of manufacturing,” Buriak said. Her team’s research supports a promising approach of making solar cells cheaply using mass manufacturing methods like roll-to-roll printing (as with newspaper presses) or spray-coating (similar to automotive painting). “Nanoparticle-based ‘inks’ could be used to literally paint or print solar cells or precise compositions,” Buriak said. Buriak collaborated with U of A post-doctoral fellows Erik Luber of the U of A Faculty of Engineering and Hosnay Mobarok of the Faculty of Science to create the nanoparticles. The team was able to develop a synthetic method to make zinc phosphide nanoparticles, and demonstrated that the particles can be dissolved to form an ink and processed to make thin films that are responsive to light. Buriak and her team are now experimenting with the nanoparticles, spray-coating them onto large solar cells to test their efficiency. The team has applied for a provisional patent and has secured funding to enable the next step to scale up for manufacturing. raphene has extreme conductivity and is completely transparent while being inexpensive and nontoxic. This makes it a perfect candidate material for transparent contact layers for use in solar cells to conduct electricity without reducing the amount of incoming light – at least in theory. Whether or not this holds true in a real world setting is questionable as there is no such thing as “ideal” graphene – a free floating, flat honeycomb structure consisting of a single layer of carbon atoms: interactions with adjacent layers can change graphene’s properties dramatically. The research recently appeared in the journal Applied Physics Letters. “We examined how graphene’s conductive properties change if it is incorporated into a stack of layers similar to a silicon based thin film solar cell and were surprised to find that these properties actually change very little,” Marc Gluba explains. To this end, they grew graphene on a thin copper sheet, next transferred it to a glass substrate, and finally coated it with a thin film of silicon. They examined two different versions that are commonly used in conventional silicon thin-film technologies: onesample contained an amorphous silicon layer, in which the silicon atoms are in a disordered state similar to a hardened molten glass; the other sample contained poly-crystalline silicon to help them observe the effects of a standard crystallization process on graphene‘s properties. Even though the morphology of the top layer changed completely as a result of being heated to a temperature of several hundred degrees Celcius, the graphene is still detectable. “That’s something we didn’t expect to find, but our results demonstrate that graphene remains graphene even if it is coated with silicon,” says Norbert Nickel. Their measurements of carrier mobility using the Hall-effect showed that the mobility of charge carriers within the embedded graphene layer is roughly 30 times greater than that of conventional zinc oxide based contact layers. Says Gluba: “Admittedly, it’s been a real challenge connecting this thin contact layer, which is but one atomic layer thick, to external contacts. We’re still having to work on that.” Adds Nickel: “Our thin film technology colleagues are already pricking up their ears and wanting to incorporate it.” The researchers obtained their measurements on one square centimeter samples, although in practice it is feasible to coat much larger areas than that with graphene. The advent of 3D printing technologies has generated new ways of representing and conceptualizing health and illness, medical practice and the body. There are many social, cultural and political implications of 3D printing, but a critical sociology of 3D printing is only beginning to emerge. In this article I seek to contribute to this nascent literature by addressing some of the ways in which 3D printing technologies are being used to convert digital data collected on human bodies and fabricate them into tangible forms that can be touched and held. I focus in particular on the use of 3D printing to manufacture non-organic replicas of individuals’ bodies, body parts or bodily functions and activities. The article is also a reflection on a specific set of digital data practices and the meaning of such data to individuals. In analyzing these new forms of human bodies, I draw on sociomaterialist perspectives as well as the recent work of scholars who have sought to theorize selfhood, embodiment, place and space in digital society and the nature of people’s interactions with digital data. I argue that these objects incite intriguing ways of thinking about the ways in digital data on embodiment, health and illnesses are interpreted and used across a range of contexts. The article ends with some speculations about where these technologies may be headed and outlining future research directions. Osteoconduction and osteoinduction of low-temperature 3D printed bioceramic implants. Rapid prototyping is a valuable implant production tool that enables the investigation of individual geometric parameters, such as shape, porosity, pore size and permeability, on the biological performance of synthetic bone graft substitutes. In the present study, we have employed low-temperature direct 3D printing to produce brushite and monetite implants with different geometries. Blocks predominantly consisting of brushite with channels either open or closed to the exterior were implanted on the decorticated lumbar transverse processes of goats for 12 weeks. In addition, similar blocks with closed channel geometry, consisting of either brushite or monetite were implanted intramuscularly. The design of the channels allowed investigation of the effect of macropore geometry (open and closed pores) and osteoinduction on bone formation orthotopically. Intramuscular implantation resulted in bone formation within the channels of both monetite and brushite, indicating osteoinductivity of these resorbable materials. Inside the blocks mounted on the transverse processes, initial channel shape did not seem to significantly influence the final amount of formed bone and osteoinduction was suggested to contribute to bone formation. Dr. Ritu Saxena’s exciting report on the fascinating work of Dr. Apostolia M. Tsimberidou “personalized medicine gearing up to tackle cancer”, inspired me to go back and review this topic and see how nanotechnology can be applied in personalized medicine. Personalized medicine in a phase I clinical trials program: the MD Anderson Cancer Center initiative. In March 2011 Nature Reviews issued a special issue features discussions of the advances, challenges and progress in the field of personalized cancer medicine by key opinion leaders who presented at the Worldwide Innovative Networking (WIN) symposium (**). So what is personalized medicine? Personalized medicine is a huge movement in the modern medical world. It aims to move away from the traditional practice of prescribing standard doses of standard drugs for a condition to every patient, and shifts the focus onto targeting the precise drug and dose required according to the patient’s physiology. This is achieved by detecting and tracking molecular biomarkers, which indicate the presence and level of activity of a particular biological system in a patient’s body, whether inherent or foreign. Another major part of the emerging field of personalized medicine is pharmacogenomics – analyzing the genetic makeup of the patient to determine whether a particular medication will be successful, or if it will have any adverse effects. (1). This is particularly important in cancer treatment, where the chemotherapy drugs used can be very damaging to healthy cells as well as cancerous ones, and the exact genetics of the tumor cells can vary widely between patients, and even between locations in one patient’s body. Given the size symmetry, nanomaterials offer unprecedented sensitivity, capable of sensing biological markers and processes at the single-molecule or single-cell level either in vitro or in vivo. Techniques are being developed for high-throughput DNA sequencing using nanopores, to obtain genetic information from a patient so that targeted medication can be selected as rapidly as possible. Cancer, a very complex disease, is propagated by various types of molecular aberrations which drive the development and progression of malignancies. Large-scale screenings of multiple types of molecular aberrations (e.g., mutations, copy number variations, DNA methylations, gene expressions) become increasingly important in the prognosis and study of cancer. Consequently, a computational model integrating multiple types of information is essential for the analysis of the comprehensive data. Tumors are known to be highly heterogenetic, due to the many acquired aberration in the cancer cells. Therefore, there are not only genetic differences between different patients, but also genetic differences within the same patient; for example from different locations in the same patient, that can greatly affect the success of a therapy. Therefore, sensitive and extensive yet inexpensive whole-genome sequencing is of major medical need to enable the application personalized medicine. A review of the potential of this emerging nanotechnology “Nanopore sensors for nucleic acid analysis ” was published recently in Nature Nanotechnology (4). The growing need for cheaper and faster genome sequencing has prompted the development of new technologies that surpass conventional Sanger chain-termination methods in terms of speed and cost. These second- and third-generation sequencing technologies — inspired by the $1,000 genome challenge proposed by the National Institutes of Health in 2004 (ref. 5) — are expected to revolutionize genomic medicine. Nanopore sensors are one of a number of DNA sequencing technologies that are currently poised to meet this challenge. approach that can be scaled for high-throughput DNA analysis. relatively low cost and supports long read lengths, so it could potentially enable de novo sequencing and long-range haplotype mapping. Although, nanopore technology is not conceptually new and raised many skeptical opinions it has made major progress in the past few years and are thus worth sharing. The principle of nanopore sensing is analogous to that of a Coulter counter. A nanoscale aperture (the nanopore) is formed in an insulating membrane separating two chambers filled with conductive electrolyte. Charged molecules (A,G,C,T) are driven through the pore under an applied electric potential (a process known as electrophoresis), thereby modulating the ionic current through the nanopore. This current reveals useful information about the structure and dynamic motion of the molecule. Here’s an example for a nanopore-based sequencing device is a Graphene- chip that is used as trans-electrode membrane (5). Electrical measurements on graphene membranes in which a single nanopore has been drilled show that the membrane’s effective insulating thickness is less than one nanometer. 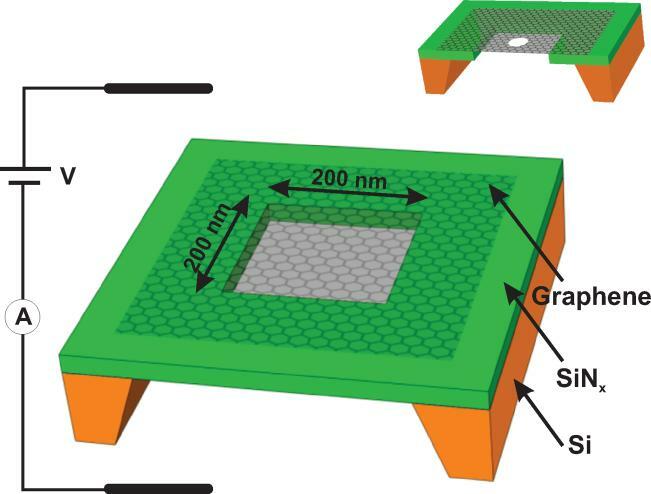 This small effective thickness makes graphene an ideal substrate for very high-resolution, high throughput nanopore-based single molecule detectors. The sensitivity of graphene’s in-plane electronic conductivity to its immediate surface environment, as influenced by trans-electrode potential, will offer new insights into atomic surface processes and sensor development opportunities. (4-6). detection of H+ ions released during sequencing-by-synthesis on silicon field-effect transistors from multiple polymerase-template reactions (Ion Torrent). However, the possibility of using nanopore-based sensors to perform long base reads on unlabelled ssDNA molecules in a rapid and costeffective manner could revolutionize genomics and personalized medicine. it would be possible to sequence a molecule containing one million bases in less than 20 minutes. Furthermore, if this technology could be scaled to an array of 100,000 individually addressed nanopores operating in parallel, it would be possible to sequence an entire human genome (some three billion base pairs) with 50-fold coverage in less than one hour.